The Faith of the Pure Ray: What Can St. Stephen Teach Us? 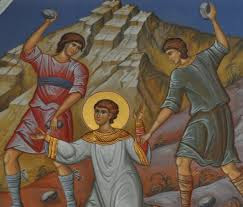 What Can St. Stephen Teach Us? On December 26th, the Feast of St. Stephen is celebrated. He is considered the first martyr of the Christian Church. The story of St. Stephen is important, also, and is just as much about Creativity and the first stage of the planning process as the birth of Jesus of Nazareth. When you come up with a plan that benefits everyone, there are people whose perspective is narrower, and they resist the creation of the plan or even pirate it, because they rely on the existing structure for their security and support. They take your plan in the belief that they can do it better than you--they see in you what is inside of themselves, and they see lack of capacity--but when it becomes apparent that they don't understand the principles and the application of the principles, that is when they try to destroy it. You must stand on the principles of the planning process and keep walking forward to overcome the resistance. Stephen was a very spiritual man who stood on the principles, and so he was targeted by people who function outside of their capacity--people who play the games of Envy and Lust, and whose power is based on weaving an illusion. These pirates used covert and overt actions to undermine him. There must be a rationale for your plan, and so we are also looking at the opposing stages of Crisis in the Family and then Conflict Resolution. A glitch came up among the members of the early church--what to do about the widows and the children of the members. Stephen and a few other men assumed responsibility for the widows and children, but was this an honor or was the responsibility foisted on them? The plan should have been amended to be more fair and equitable than to turn such a huge financial responsibility over to a few men. The plan evolved to asking for donations from the people outside the members, possibly after the others saw how Stephen was defamed. How do we know he was defamed? Stephen was a spiritual man who stood on the principles and that triggered a character defamation campaign against him by those who function outside of their capacity. You cannot defend yourself from prejudice and ulterior motives, so he was accused of blasphemy against Moses, he went before the Sanhedrin to be officially judged, and was taken out and stoned. The story that has come down through history is that Mary Magdalene had seven demons. She played all seven of the Seven Deadly Sins power games, which are based on three fears. Her fears overcame her, and she compensated by playing the games of revenge, and she tore apart the city with her acts of mayhem. She was so far out of control that to stop her, the people tried to stone her. That is when Jesus stepped in and defended her. He had faced the darkness and temptation, too, and he assumed responsibility for helping her overcome her fears. The story has come down through history that Stephen was a spiritual man who assumed responsibility for the care of widows and children, but he was defamed, and while he was being judged, he prayed for his executioners, just as Jesus did. That brings Saul of Tarsus into the story. He stood and watched the stoning and did nothing to stop it. To stop a genocide--and character defamation is an individual form of genocide--someone must stand up and say stop. Saul had three choices. He could stop it by defending Stephen, which is what Jesus did with Mary Magdalene. He could ignore it and walk away. He could join the executioners. By ignoring the crisis, he passed it on to future generations--the widows and children. Christmas Day focuses on the male and female coming together to create a plan that benefits everyone. There was resistance to the plan. We know King Herod knew of the birth of a potential threat to his power, and that Joseph and Mary were driven out of the country. Everyone must assume responsibility for his or her own financial support. Each of us was born with our talents and gifts. Our World Peace Marketing Strategy helps to solve that problem, and the Faith of the Pure Ray is the first step in assuming responsibility for our own financial foundation. There were twelve disciples who came together based on the principles of the cooperation of nature. They are the Flower of Life level, and that level is responsible for handling complaints. Each level teaches the principles of the plan to those who are the application of the principles. It becomes a family, and each generation is responsible for teaching the principles to the next generation.